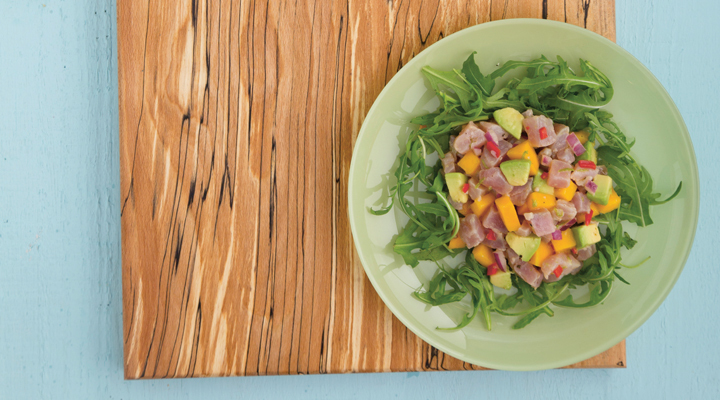 Put the tuna in a glass bowl with the mangos, red onion and chilli. Grate the zest of one of the limes and add it and the juice of both limes to the bowl along with the olive oil. Season with salt and pepper and stir gently to coat everything. Add the avocado to the salad and give it another good stir. Refrigerate for 1 hour to allow the lime juice to ‘cook’ the tuna. Serve the ceviche on a bed of mixed salad leaves with some crusty bread on the side, but omit the bread for a gluten-free meal.